Spring is the season we generally associate with the renewal of life ... birds nesting, frogs mating, and flowers blooming. Yet even now, late Autumn, it's on again! For some of the insects, anyway. As many honeyeaters are flying north, and hoards of young Fairy Wrens and Rosellas are gaining independence, other species are taking a different approach to the coming Winter. 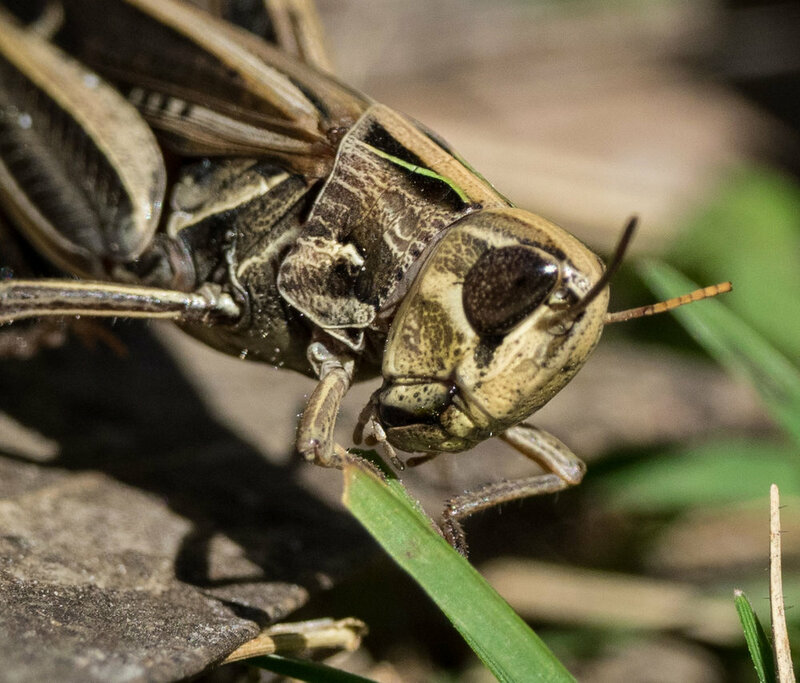 For most adult butterflies and grasshoppers, their days are numbered – and they're mating with renewed urgency. The two butterflies currently about in large numbers are the Common Ringlet (Hypocysta metirius), and the much larger Common Brown (Heteronympha merope). Both are breeding, but they display quite different life histories. Hypocysta metirius is widespread along the east coast of Australia. We live at the very southernmost limit of their normal distribution. Throughout the forest, male Common Ringlets (Hypocysta metirius) are currently patrolling territories and launching attacks upon intruding males and other trespassers. But when a female Common Ringlet arrives, the pair's fluttering, spiralling courtship ends in a coupling that may last for hours. The female then lays her eggs among the grasses. Many butterflies overwinter as caterpillars or pupae and the Common Ringlet is no exception. In Queensland, Common Ringlets breed year round. 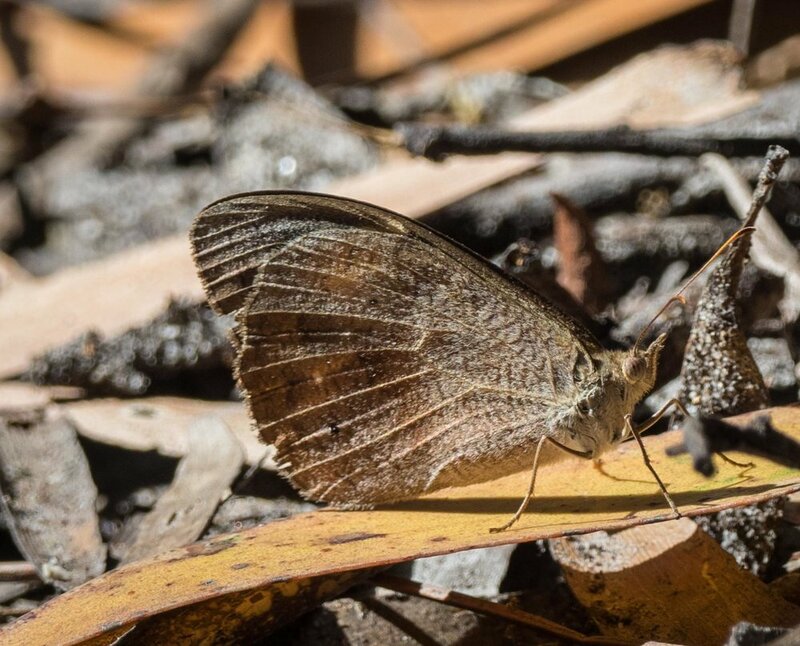 Here in the forests of southern NSW, however, adult Common Ringlets appear in October and then disappear in April. Yet even here they manage multiple generations each year. The 'April butterflies' I've been seeing this week were no doubt 'Summer caterpillars' – their immaculate wings are evidence that they eclosed from their pupal cases only recently. Their own offspring, however, will develop much more slowly. Insect development is highly temperature-dependent. These 'Winter caterpillars' will become the first adults to eclose in Spring. The large Common Brown (Heteronympha merope) is busy laying eggs too, but without all the fuss. There are no males! This female Heteronympha merope may be 7-8 months old! Common Browns have just one generation each year. Mating takes place in Spring, and the males soon die. But the females simply rest throughout Summer, emerging in Autumn to deposit their eggs among the grasses. Common Brown females are beautiful and highly visible butterflies in flight. But they are also incredibly cryptic. Once they land in the leaf litter and close their wings, they simply disappear. There are numerous grasshoppers around this week. 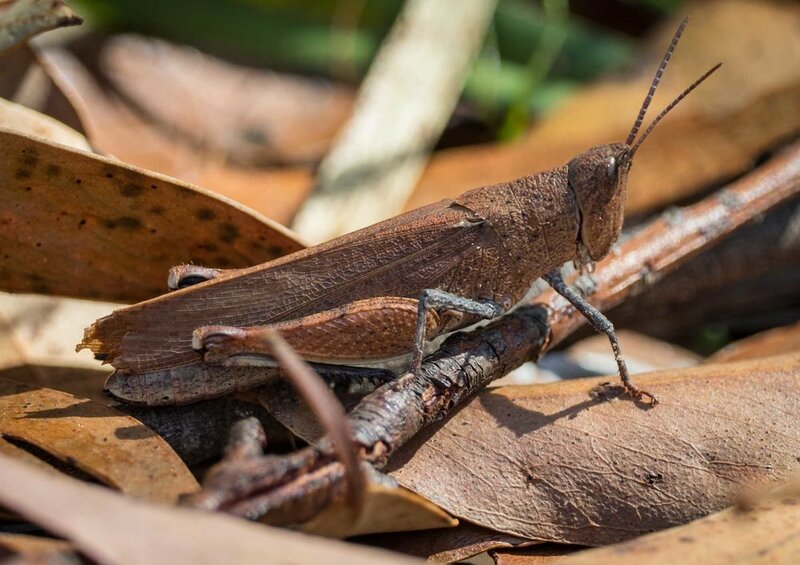 Most are quite familiar to us, such as the small 'Wingless Grasshopper' (Phaulacridium vittatum) and the highly cryptic 'Gum-leaf Grasshoppers' (Goniaea sp.). But it is a third species, Caledia captiva, that has been attracting my attention. We have not noticed this species here before now. And they are hard to miss, flying loudly and with a flash of yellow when disturbed. So I've been spending some time watching and photographing them. And their antics are quite hilarious. The larger females are eating. And eating. And eating. But the males seem to have no interest in food. They are solely focussed on mating. At times there may be four or five males clambering about atop a female, trying to dislodge the opposition. And all the while, the female just keeps eating! A Google search (and a subsequent, slightly more rigorous literature trawl) revealed that this species is quite well-known and described – and for two rather different reasons. 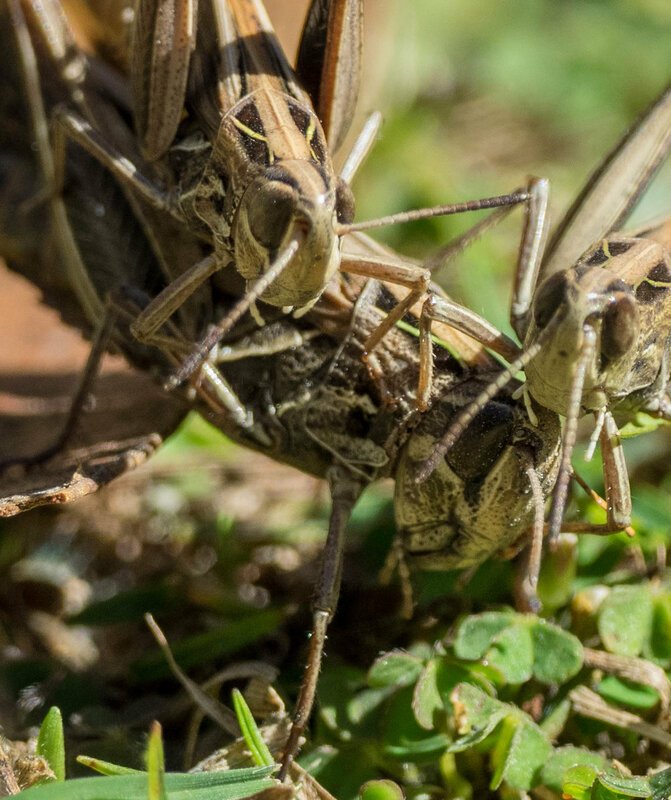 The adults are a similar size and shape to the Australian Plague Locust (Chortoicetes terminifera) - but Caledia captiva is not a 'locust'. That is, this species does not form the swarms so alarming to farmers. A nice example of why accurate species identification matters! 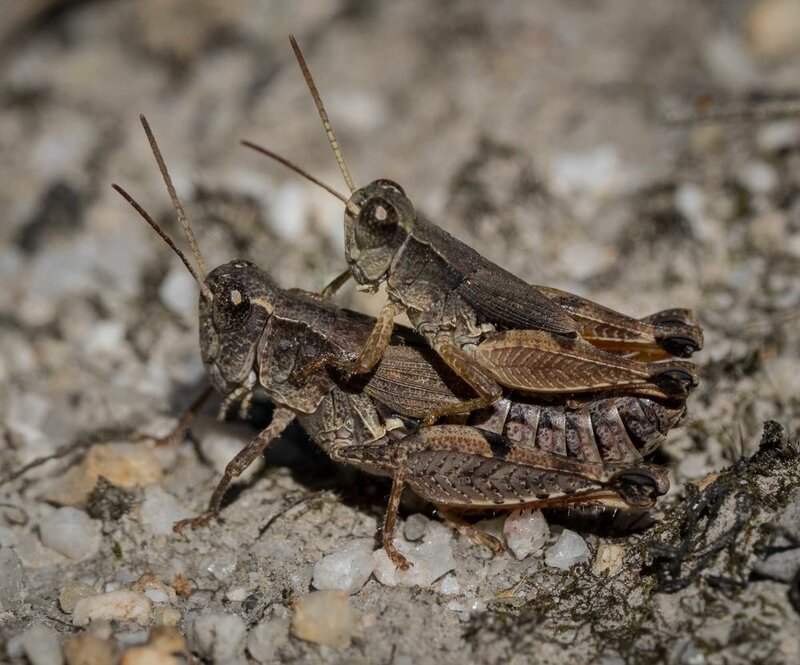 Government departments collect reports of locust activity and so provide extensive resources to help with species identification (see references, below). Caledia captiva exhibits what ecologists term 'life cycle flexibility'. Most of the eggs laid now will develop a little, then stop. They overwinter in 'diapause', resuming development and hatching next Spring. 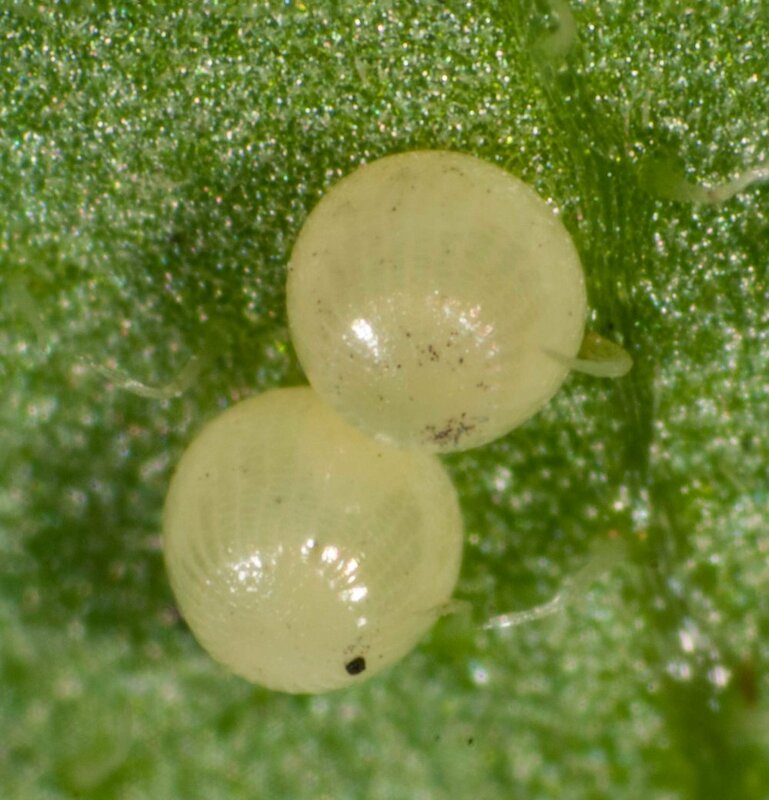 But some eggs will hatch soon, to spend winter as feeding nymphs. The 'Winter nymphs' will be breeding adults by Spring, giving them a head start for the Summer. A battered male, missing a hind leg and wings on one side ... and yet he was still competing for the female! Groeters & Shaw, 1996. 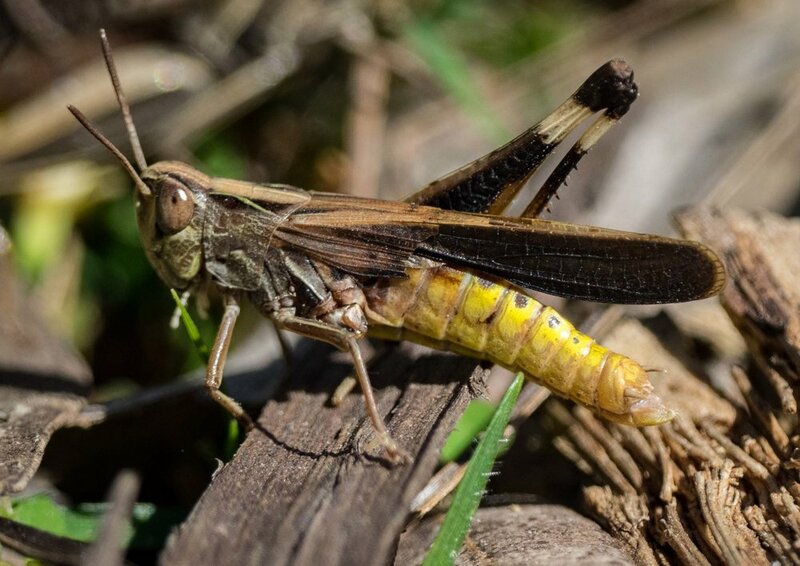 Evidence for association of chromosomal form and development time from complex clines and geographic races in the grasshopper Caledia captiva (Orthoptera: Acridadae).